True ownership of one share of Netflix stock framed like you want. The recipient becomes a real shareholder of the company. Television fans everywhere love Netflix! 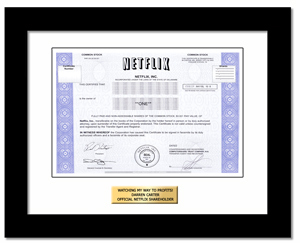 The Netflix Stock certificate is strikingly ornate. It represents a snapshot of history incorporating the company's name, logo, corporate seal, and printed signatures of corporate officers. Get yours while you can because in the not too distant future, the industry will eliminate physical stock certificates making these valuable collectibles. Netflix is the world’s leading Internet television network with over 65 million members in over 50 countries enjoying more than 100 million hours of TV shows and movies per day, including original series, documentaries and feature films.